Have you ever seen the inside of your drains? If not, we can’t blame you—it’s really dark and hard to see down there. Of course, we see them all the time, along with the dirt and sludge that we wash out of it. When left uncleaned year after year, drains can get seriously dirty, and that can lead to all sorts of inconveniences. Sometimes, people get “dirty drains” and “clogs” a little confused. A drain clog is a blockage that prevents water from going down your drain. A dirty drain is everything that happens before the clog! Dirty drains typically begin with the substances that are capable of forming a surface for a clog. Namely, things like fats, oils, and greases. These substances are liquid when warm (like right after we’re done cooking with them), and then begin to congeal when they cool. But it’s not just the kitchen—the fats in our soaps and the oils from our bodies can create a similar affect in your shower drain. Combine those dirty drains with solid substances: hair, bits of food, scraps of trash… With enough time, that’s how you’ll get a clog. Before the clog is fully formed, you might encounter the issue of a slow drain. For example, you finish washing your hands at the sink to find that the soapy water just sits at the bottom of the sink. It takes several minutes for enough water to drain that you can finally rinse out the rest of the soap. More than just an annoyance, this is a sign that your drains need a thorough washing. Bad smells coming from your drain? That’s not normal! This could be sewer gas making its way up your drains. Or, it could be biofilm, a collection of bacteria that often forms inside drains and gives off a bad odor. Running hot water and soap down the sink going to help, so you’ll need nothing short of a professional drain cleaner in Deptford Township. A professional plumber may employ several different methods for thoroughly cleaning your drain, but the most common method is to use a hydro-jet. This tool is a long line, often hundreds of feet long, that is fed into your drain. 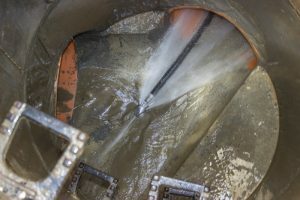 The end of the line releases highly-pressurized hot water, spraying down the walls of the pipe to clear out all the built-up grease and sludge. Is it time for a drain cleaning? Contact SPS Mechanical Inc. today to schedule a service.